When Myrna started steaming vegetables enthusiastically, I purchased a steamer and have been doing the same. I was amazed how quickly they steam. When I want to steam very small amounts or a half-dozen eggs or less, I like my cheap, $10 stainless steel steamer I purchased at my grocery that expands to fit a variety of pans. It is sturdy, goes through the dishwasher, doesn’t stain, and folds up very small for storage. It works in pressure cookers or instant pots too. The directions for steaming eggs, which is the perfect way to get easy-to-peel eggs, are HERE. I always steam potatoes now too, they are never soggy! 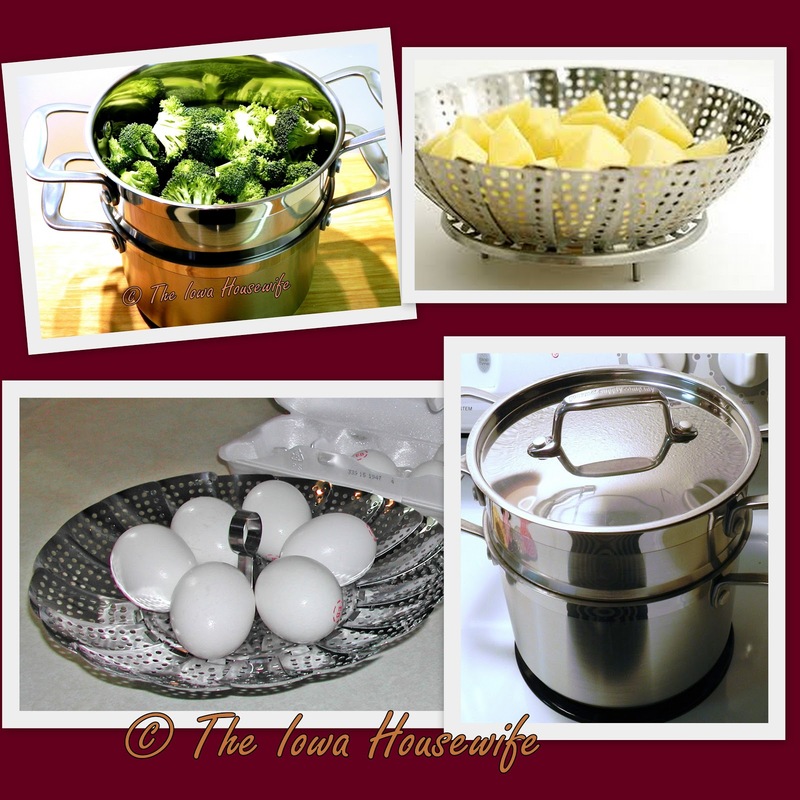 When I want to steam large vegetables, like broccoli, cabbage or cauliflower, I use my 2 quart stainless steel steamer that comes with a pan, insert and glass lid. I can use the pan alone too. I prefer the steamer for plain vegetables. However, that said, sometimes you want the flavor of broth or wine with your vegetables, and you need to know that cooking time as well. Here’s a quick reference chart that I keep posted in my kitchen, inside a cabinet door. I use the shortest cooking time for crisp-tender vegetables. I have been steaming eggs since my sweet younger cousin told me how. See, this old dog learned a new trick. Cannot believe how easily they peel! Isn't that the truth, when I think of all the years I could have been doing that I sure wish I had known about it earlier. A steamer would be useful for me just now, the potatoes I have at the moment seem to collapse if cooked conventionally! A wire rack that fits a pan you have would work. Just keep them above the water. It really helps with otatoes that tend to collapse. I hate mushy potatoes and haven't had them with steaming instead of cooking them.